Another ‘rave from the grave’ as I begin to position myself personally to commence a BA (Hons) Degree in Photography. I know, its about time too! My thanks particularly to Kevin Wilson for his lifelong friendship and support and to Chris Harper, CEO of the BIPP for making the dream of an industry relevant qualification into a credible reality. Back in March of 2009 I was running a professional development training course in Dublin’s fair city and after a fruitful day, decided to go for a pre-dinner walk along the banks of the Liffey. On this particular evening I was being treated to a tour of the town with it’s lights and sights. 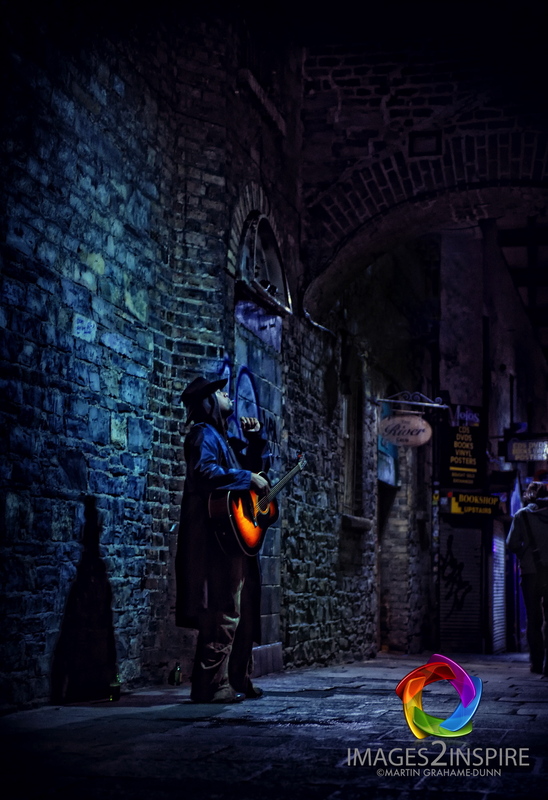 Strolling casually along the banks of the Liffey I caught saw a musician busking in a dark alley under some beautiful and interesting directional lighting. JI was eager to capture the scene without him being aware of my presence. I was so happy I’d taken my camera with me! My Nikon D700 was armed with a 24-70mm f2.8 lens, a most amazing piece of glass. Unusual for me as I’m a huge fan of ‘Prime Lenses’. I had been eager to really push the ISO capabilities of the camera. The guy was still unaware of my presence and continued performing with passion. He stopped for a moment to draw on the hand rolled cigarette and I just had to capture that moment of savouring the pleasure he was clearly experiencing. Camera down, eyes wide open, ISO pushed to 1600, aperture to f2.8, scene reviewed and I lifted the Nikon to my face setting the focal length to 55mm and ‘click’, captured my shot. In fact I only took three frames before he noticed I was there and the moment was over. I knew that the initial capture was only the beginning of the road for this image. I couldn’t wait to download the JPEG (Yes, I did say JPEG!) and start playing with my vision using my expertise with Nik Software. I was prepared to use the full suite as best I could and I hope you enjoy my journey to the end result. First things first I wanted to check the noise levels. Even though I am well aware of the amazing low or even no noise capabilities of Nikon cameras. With an ISO of 1600 selected I just wanted to be sure particularly in such a low light situation. And so I gave it a courtesy ‘swipe’ through Nik Dfine 2.0 ‘to be sure, to be sure!’. I also did a little ‘mess clearing’ removing the obvious unwanted bits and pieces that just had to go. De-cluttering is so important and as I often feel I suffer from OCD in my photography, it was doubly important to me. Of course the way we view an image can change throughout the manipulation process and I was totally sure I would be doing more tidying later. Next step was to apply a tricky effect known as ‘Tonal Contrast’ from the Nik Color Efex 3.0 palette (this has now been superseded with Color Efex 4.0 in the Nik suite now from Google. Go to www.niksoftware.com for an amazing deal on this invaluable collection of 7 products!) In the latest version of Color Efex you will find a different tool called ‘Detail Extractor’ which I’d certainly use in preference to ‘Tonal Contrast’. This effect or similar has been used by some fairly well known shooters in the production of more surreal than figurative images. I know we see a huge amount of HDR ‘feel’ images, but there is a time and a place where it simply works and this to me iwas one of them. My main objective was to pull out detail and texture in the brickwork and this filter is a marvel at that! The key thing is to play with the sliders and apply the effect in a painterly way. I was particularly careful to avoid the subject’s skin. Texture abundant and on to the next step. Using the ever popular and probably most misused ‘Midnight’ filter I decided to apply a kind of vignetted feel to accentuate the ‘hot’ area and draw the viewers attention to the key subjects. I so love this tool but if it is not applied in the right way there will be banding at worst and halation around your subject at best. So, BEWARE and use with caution!!! A little more retouching now removing any remaining annoying highlights towards the edges of the image that would further constitute distractions if this were ever to become a ‘competition’ print. It is at this stage I have become at my most critical, and to be honest and before any of you say it, Yes! I am bothered about the brightness of that street light!!! But it should not the ‘be all and end all’ of an image. I get a little weary of the constant spouting of so called photographic rules. After all, who says they are rules? Aren’t the only real ‘rules’ the laws of physics that govern the use and mechanics of light? The last thing is all about the colour. I am no fan of green tones and lean more towards ‘hot’ images. First task was to beef up certain areas with the magic of Viveza (I so wanted to heat up that guitar) which having sorted that and the tip of his glowing cigarette I finished up by a preferred colour adjustment simply through Photoshop. And there we have it, my “Liffey Serenade”. Just to end this story, I thanked the guy profusely and offered him some money which he politely declined as he was simply busking for fun! I so love Dublin and the Irish!. Nik Sharpener Pro 3.0 for the best selective sharpening tool on the market!